A photojournalist in Norway was out on assignment for a TV station when the cosmos aligned to create something truly otherworldly. 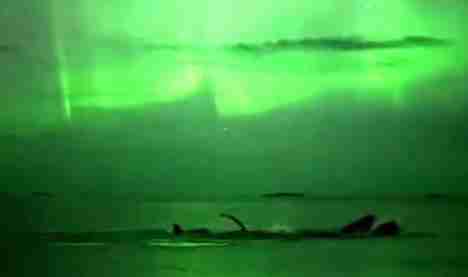 A group of humpback whales appeared, playing and fishing for herring in the water off Kvaløya (which translates to "Whale Island"), just as the aurora borealis, or the "Northern Lights," started to put on a supercharged, luminescent show. The photojournalist, Harald Albrigtsen, was lucky enough to catch the majestic moment on camera. 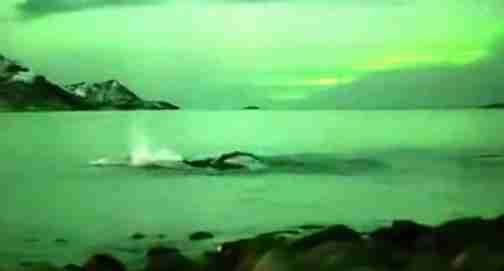 The bright green, glowing light is produced by oxygen particles colliding in the atmosphere with supercharged particles from the sun. That might explain the brilliance of the light, but the whole phenomenon caught on camera has a magical quality that's truly inexplicable.